This whole post is basically an excuse to post the lovely picture above. Foreign readers may find it a bit confusing, so here is some context. Last year Ireland held a referendum on the Lisbon Treaty, an agreement reached between European Union heads of government. The Treaty was rejected by Irish voters, causing a sensation throughout Europe. Next Friday we are going to be voting on the Treaty again. There are a couple of justifications for having another referendum. First of all, many people last year claimed to be confused by the whole Lisbon Treaty business, so maybe with the passage of time they will have made some effort to inform themselves. Secondly, the EU heads of government have made some non-binding guarantees on some of the concerns of the Irish voters. Thirdly, the astonishing deterioration of the Irish economy since the last vote suggests that now might not be the time to piss off our powerful European friends. The pro-Treaty side in the referendum are basically the entire Irish political establishment, in so far as they are from almost all the parties that people actually vote for in elections. The implicit main plank of their campaign is that the country will go down the plughole if Lisbon is rejected, though they have never been quite so crude as to explicitly state this on election posters. The anti-Treaty side mine a broad vein of disaffection. There is a tendency in some quarters to divide the antis into right-wingers (typically worried that the EU will force everyone to have abortions) and left-wingers (typically worried that the EU will draft everyone into an EU army or make everyone slaves of large corporations). I think, though, that more unites the antis than this kind of analysis suggests. They all distrust mainstream Irish politicians. They all fear that Lisbon represents a terrible and irrevocable loss of sovereignty, a transfer of power to some sinister and shadowy EU elite; the only difference is in what they think the EU overlords will do with that power. Cóir are one of the players on the No side. I have heard it said that they spring from the same stream that gave us Republican Sinn Féin (a fringe Republican movement who reject the Good Friday Agreement and almost everything else) and Youth Defence (a hardline anti-abortion movement). I'm not going to link to their website, but if you go there you will get a flavour of their campaign against Lisbon – slogans suggesting that Lisbon would reduce the minimum wage to around two Euro, that Lisbon would eliminate the freedoms for which our country's founding fathers died, or that Lisbon would lead to an inrush of foreigners to this sceptred isle. The above image is a parody of one of their posters*. It is rather like shooting fish in a barrel, as the petty concerns of Cóir are godsends to people who support Lisbon. A spice burger is a fast food product that bears some mysterious relationship to meat. "Away with you, you wife swapping sodomites!" was the celebrated response of a Catholic conservative to the passing of the referendum that legalised divorce. Parody posters seem to be quite a thing this time round. Another Cóir parody I have seen points out that 98% of Europeans are foreign. 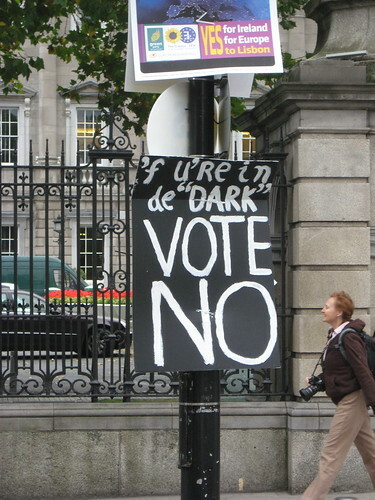 On the other side, a subtly ironic poster has Adolf Hitler urging a Yes vote. *I apologise to Irish readers for stating the obvious to an almost Wikipedia-esque extent. Before you explained the reference, I was thinking that "somdomites" would be even better. There's another one of those handmade posters (ie, an identical one) out at UCD. Which I find very strange. The guarantees aren't "non-binding". They don't change the treaty as they simply state what the treaty isn't about and what it doesn't do. Technically speaking they are interpretative declarations which a court would have to take notice of when interpreting the treaty. Moreover the guarantees will be made into a protocol at the earliest opportunity (probably Croatian accession). The Danes received similar guarantees after they rejected Maastricht. The resulting protocols are still in force today. I think, though, that more unites the antis than this kind of analysis suggests. They all distrust mainstream Irish politicians. Big businesses are coming. Thank you guys for voting yes. Michael J. Walsh, I meant that the guarantees are non-binding in the sense that they are not a new treaty or protocol, but just interpretations of the treaty or political guarantees.